Location: Laréole, in the Haute-Garonne departement of France (Midi-Pyrenees Region). Notes: Château de Laréole is a French Renaissance castle dating from the sixteenth century located in the municipality of Laréole the township of Cadours in the department of Haute-Garonne in the region Languedoc-Roussillon, Midi-Pyrénées near the Gers. 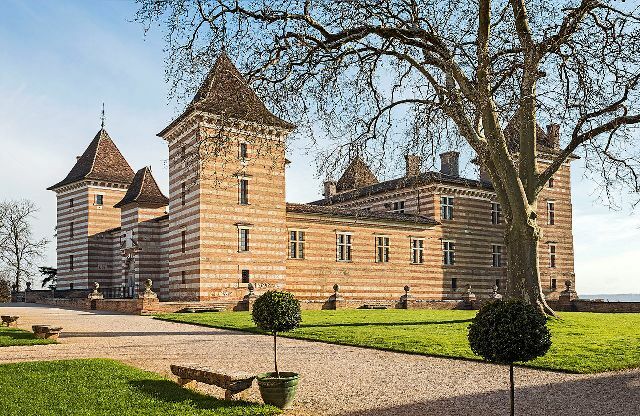 It was built by a wealthy woad Toulouse and it now belongs to the County Council of Haute-Garonne.Laréole Castle was built in 1579, on the common Laréole, bordering the hills of Gascony, for Cheverry Stone, son of a large pastel merchant by architect Dominique Bachelor, son of Nicolas Bachelier. It was long a secondary residence, where Toulouse notables came to relax. Construction of the castle lasts three years and the family Cheverry guard the castle until 1707. A wealthy banker Toulouse, Jean-Pierre Colomès, then becomes the owner. During the Revolution, the castle changes hands several times and then abandoned it in 1922. In 1984, in a heritage conservation purposes, the General Council of Haute-Garonne buys the property. In the eighteenth century it was enriched with a French garden and statues of Marc Arcis. The castle is classified as a historical monument since 1927, the common portal and the balls since 1991 and the castle park, moat, courtyards and terraces since 1994. The site is open to the public and free or guided tours are free. Inside the empty castle is used as a showroom in summer. The park meanwhile is the setting for a festival taking place from mid-July to late August every weekend offering late afternoon circus performances, dance or theater are free.